Patagonia is one of the most pristine and wild regions on our planet. Just the word itself evokes images of windswept landscapes with jagged granite spires twisting to the sky, immense glaciers and some of the largest ice fields on Earth. Spanning the southern regions of Chile and Argentina, hiking in Patagonia offers a diverse mix of landscape, flora and fauna, including guanacos, condors, red-headed woodpeckers, and if you’re lucky - maybe even a puma, huemul, or pygmy owl. For all its beauty and grandeur, hiking in Patagonia can be a very accessible activity. Trekking tourism has been rapidly increasing in Patagonia over the past five years, so you should expect to be sharing the trails. Though many people hike with organized tour groups, hiking independently is very possible in most places. Even those with little backpacking experience will find trekking in Patagonia to be an accessible and absolutely unforgettable adventure. 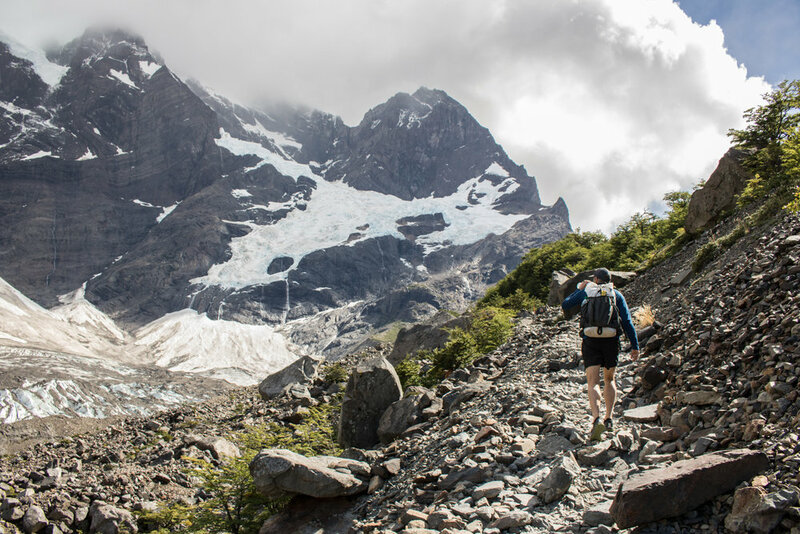 SUMMER (December-February): The peak hiking season in Patagonia is during the summer months of December through February when the temperatures are the warmest and days are the longest. Though hiking in 60-70 degree temperatures is quite nice, the crowds will be high and the wind can be fierce during this time of year, with gusts up to 75 mph at times. It’s common to receive some precipitation during the summer months, though with less intensity than in the fall. FALL (March-April): Hiking in the fall months can be a nice alternative to summer. The temperatures will be slightly cooler, but the crowds will be lighter and the wind is often less intense during this time. However, precipitation can be highest during the months of April and May, so you’ll want to plan accordingly. Many people also choose to come during fall months to watch the trees turn from green to a fiery red, which is a breathtaking contrast against granite and glaciers. SPRING (September-November): Hiking in the spring months is a great way to enjoy Patagonia before the swathes of tourists arrive. Temperatures will be cool with daytime highs averaging in the 50's, so you'll need to bring warmer clothing. You can also expect less wind and less precipitation during spring months compared to summer. The weather in Patagonia is ever-changing and unpredictable. You’ll often hear people talk about how you can experience all four seasons in one day, any day of the year. 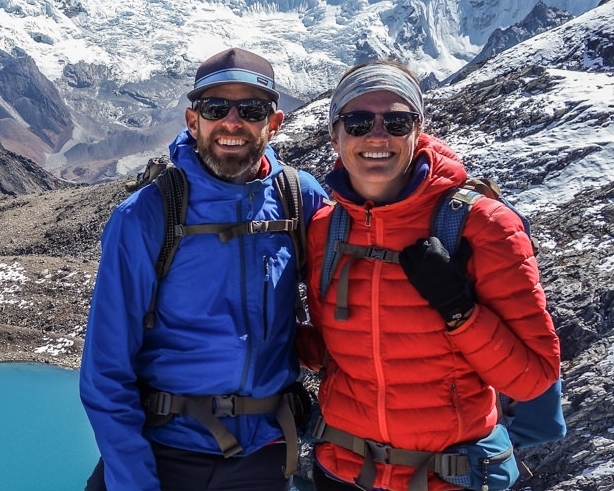 Check out our Patagonia Packing List to make sure you're prepared for the wide range of weather condition you'll encounter. During your trip, you’ll most likely experience some rain, but what will stick with you is the wind. It'll be like nothing you’ve experienced before. The strongest winds occur during the summer months of December to February, with gusts up to 75 mph possible. The air is calmer in spring and fall and almost non-existent in winter. Always be careful on exposed ledges, suspension bridges, or on pass days if winds are high. The best source for finding information on weather is at www.windguru.com, which will provide information on wind speed and gusts, precipitation, and cloud cover. If you stop by a ranger station in the area you'll be hiking, they'll most likely have the Wind Guru forecast printed and can help you decipher the somewhat confusing grid of numbers. Most people traveling to Patagonia will first arrive at either the Comodoro Arturo Merino Benítez International Airport in Santiago, Chile or the Ministro Pistarini International Airport in Buenos Aires, Argentina. From here, most people take a domestic flight to the Patagonia region. If you fly into Santiago, it's most economical to take a domestic flight to Punta Arenas, Chile to begin. If you are coming from Buenos Aires, it generally makes the most sense to fly to El Calafate, Argentina. The reason for this is because it can be very expensive and time consuming to fly between countries (ie. from Santiago to El Calafate). For example, to fly from Santiago to El Calafate on our last trip would have taken 16 hours due to a long layover in Buenos Aires en route to El Calafate. It was also a very costly option. So plan your international and domestic flights accordingly. Once you're in the Southern region, it is easy, affordable, and convenient to bus between the main trekking areas in Patagonia. More on that below. Although there are some long distance buses running routes connecting the northern and central regions of Patagonia to the south, for this section we’ll focus primarily on getting around the Torres del Paine and Los Glaciares regions, as this is the most common route people will use during their visit. There are many bus companies running routes between the towns of El Chalten, El Calafate, Puerto Natales, and Punta Arenas. Most of the buses are reliable, comfortable, and punctual. We recommend buying your bus tickets ahead of time, especially during peak season. Purchasing your bus tickets online is easy and convenient with BusBud and Recorrido.cl. You can save a couple bucks by purchasing your tickets in country, but for the piece of mind and ease of planning, we found this convenience to be well worth the money. Below is an idea of general bus times between towns. We found the buses to be very punctual and their estimated times to be accurate, with the exception of the bus from Puerto Natales to El Calafate, which involves an inherently unpredictable border crossing. Our one complaint regarding the bus travel was that it is very difficult, perhaps even impossible, to make the bus trip from Punta Arenas to El Calafate in one day due to the schedule. Almost all people have to break the trip into two days with day one from Punta Arenas to Puerto Natales and the next day traveling from Puerto Natales to El Calafate. It’s possible to catch a bus from El Calafate to El Chalten that same day. According to the US State Department, U.S. citizens do not need a visa for visits of up to 90 days for tourism or business in both Chile and Argentina. We recommend checking with the State Department of each country prior to your trip to ensure requirements haven't changed. Upon arrival, you'll receive a visa at no cost. You're able to move freely between the countries with very little hassle. You'll want to make sure you hold onto the immigration form you'll receive from Chile upon entrance, as you will need to present this to many hotels as well as customs prior to leaving the country. Regarding customs, Chile is very particular and strict about the food you bring into the country. If you're bringing any plant or animal products you must declare them on the immigration form. There are heavy fines associated with bringing in items that you failed to declare, so to be on the safe side, we recommend declaring any food items. For example, we brought some freeze-dried backpacking meals and energy bars from the United States which contained meat product, so we declared them. We had no issues. To put it simply, Patagonia is not a cheap place to visit. Compared to other South American destinations, you can expect to pay more for lodging, food, and pretty much everything. If you’re on a tight budget, there are generally free or very cheap places to pitch a tent around many of the towns. Also, buying your food at grocery stores rather than restaurants or refugios can make for a more affordable trip. The type of lodging you choose along your hiking route will dictate costs significantly. Generally speaking, there are three levels of accommodation in Torres del Paine: refugios, supported camping (you prearrange renting equipment at each site), and camping (you bring your own gear). In the Fitz Roy area, camping is free. If you choose to hike with a guided group in either region, you should expect to pay significantly more than if you decide to hike independently. More on this later. Many of the hiking areas in Patagonia have a system of mountain huts called refugios along popular backpacking routes. For many, the existence of refugios are what makes hiking so accessible in Patagonia. They almost always provide meals, drinks, and snacks for purchase so the only thing many hikers need to carry is a daypack with their essentials. Refugios can range from small charming huts with 6 rooms to large hotels serving hundreds. Regardless of size, almost all refugio sleeping options offer dorm-style bunk bed accommodation. Almost every refugio offers meals and has a small store, though prices are quite expensive. You'll have the option of adding full-board to your refugio stay which includes a breakfast, a packed lunch for the next day, and dinner. Most refugios also have showers, shared bathrooms, and areas to chill. We recommend packing your own sleeping bag, as some refugios only offer a bottom sheet on the bed. For a more economical and adventurous option, you can camp at all the sites with a reservation, where necessary. The campsites are generally located right outside or very near the refugios. Although you're not paying to spend the night, you're almost always able to use the facilities in a refugio, buy a meal or a beer, take a shower, and use the outlets to charge your devices (though it's customary for refugio guests to get first dibs). Having a glass of wine in the refugio before crawling into your tent is a rare and wonderful wilderness luxury! Patagonia is a vast, massive region spanning thousands of miles. For ease of planning, we’ll break down each region and discuss highlights of each area. Most people who visit Patagonia for the first time will visit the Torres del Paine region of Chile and the Fitz Roy region of Argentina. Though these places absolutely deserve to be on anyone’s itinerary to Patagonia, there are also more off-the-beaten-track options that offer just as much beauty with significantly more solitude. TORRES DEL PAINE - If it’s your first time visiting Patagonia, a trip to Torres del Paine should definitely be on your itinerary. Located on the Chilean side of the Andes and a two-hour bus ride from the gateway town of Puerto Natales, most people spend multiple days hiking through this region on either the W, O, or Q trek. It's one of the busiest hiking regions in all of Patagonia, so don't expect too much solitude. If you're hiking independently, you'll need to begin planning and booking your campsites months in advance, as competition is high and coordinating with the three reservation systems (Fantástico Sur, Vertice, and CONAF) can be a test of patience. If you have the time and ability, we highly recommend completing the full circuit or O Trek in Torres del Paine. LOS GLACIARES NATIONAL PARK - Argentina’s most famous National Park, Los Glaciares, is home to the famous Fitz Roy massif as well as the Perito Moreno Glacier. Often referred to as the adventure capital of Argentina, the charming and quaint town of El Chalten is the jumping off point for hikes around Fitz Roy, with trails literally leaving from town. There are many great day hiking opportunities, but we recommend immersing yourself in this region with a multi-day backpacking trip. Located three hours south of El Chalten, the larger and more commercialized town of El Calafate is the jumping off point for a visit to the world-famous Perito Moreno Glacier. CHILEAN LAKES DISTRICT - Compared to the glaciated regions down south, the Lakes District in Chile offers a landscape dotted with lakes, rivers, volcanoes, and a temperate rainforest. Though not as epic as the Patagonian regions down south, there are many hikes in the Huerquehue National Park and Villarrica National Park. This region is also the official starting point for the famous Carretera Austral, the rugged and picturesque "highway" that stretches 1,240 kilometers down to Southern Chile. NORTHERN ARGENTINE PATAGONIA - This beautiful region has numerous glacial lakes, stunning mountain vistas, and wonderful white water rafting opportunities. Most travelers accessing this region do so through Bariloche, which is often referred to as the Argentine Switzerland. Home to two National Parks - Parque Nacional Lanín and Parque Nacional Nahuel Huapi, there are numerous hiking and backpacking opportunities including some awesome refugio trips where you can string together hikes to isolated huts in the mountains. There are also some great multi-day backpacking trips through Parque Nacional Nahuel Huapi. 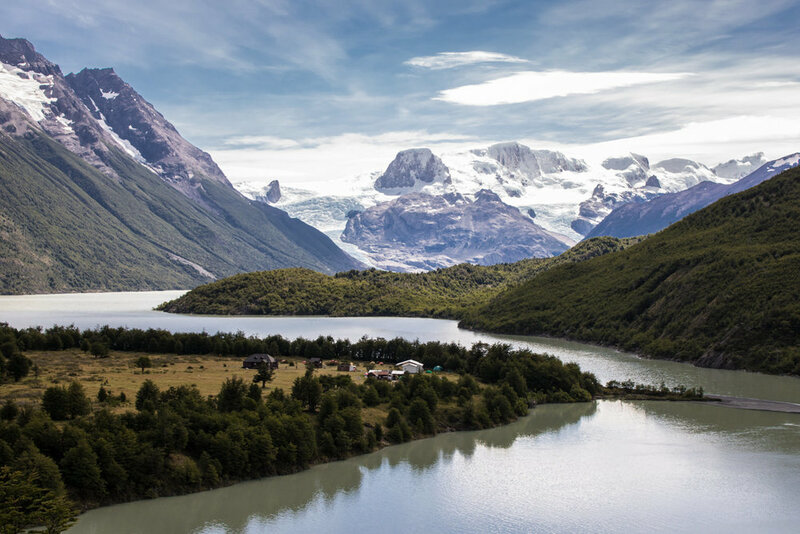 AYSEN - Perhaps the region we’re most excited to explore on our next trip - the Aysen region - is located between the Lakes District of the north and the more popular Torres del Paine region in the south. The Aysen region is vast, remote and has so much to offer on a less-traveled route. You can expect huge glaciers, turquoise lakes, temperate rainforests, and great backpacking and hiking options. This area is far less developed than both the Lakes District and the Southern Patagonia regions so transportation and logistics can be more difficult. The Cerro Castillo Reserve is located in this region and offers a fantastic 4-day backpacking trip. We recommend renting your own wheels to explore. You’ll also see many cyclists and hitchhiking backpackers along the Carretera Austral, the stunning 1240 kilometer highway, which alternates between pavement, gravel, and dirt, and runs through the heart of this Aysen region. SOUTHERN ARGENTINE PATAGONIA (TIERRA EL FUEGO) - At the southernmost tip of South America sits the large archipelago of Tierra del Fuego. Though you can access this region by bus or ferry, most people opt to fly to the town of Ushuaia. Often considered the “end of the world”, Ushuaia is a resort town most notably used as a jumping off point for cruises to Antarctica. Only 7km outside of Ushuaia is Parque Nacional Tierra del Fuego which has some of the most rugged and extreme landscapes on the continent. The most popular day hike in Tierra del Fuego is the Glaciar Martial, which is a steep but beautiful climb to expansive summit views of the Beagle Channel and Cordillera Darwin. There are also some multi-day backpacking opportunities, such as the Montes Martial Circuit, though they are quite challenging and can be logistically more complicated. It would be impossible to list all the varied and unique trails in Patagonia. So instead, we wanted to highlight a few of our favorites and some popular recommendations. These trekking routes are all exceptional and a great place to start for your first trip to Patagonia. W TREK - Located in Parque Nacional Torres del Paine, the W trek is by far the most popular multi-day hike in Patagonia. Covering roughly 80 km (~50 miles) and usually completed in 4-5 days, the W Trek highlights some of the best sights in the region. O TREK - Also known as the Circuit of Torres del Paine, the O Trek covers the same trail as the W Trek, but also traverses the less visited backside of the park. Over the course of 110 km (68 miles) you'll connect the two ends of the W. Generally completed in 6-9 days, you’ll spend 2-3 nights camping on the backside, which offers more solitude albeit less dramatic views. However, compared to the W trek where you can stay in refugios every night, camping is required to complete the O Trek. 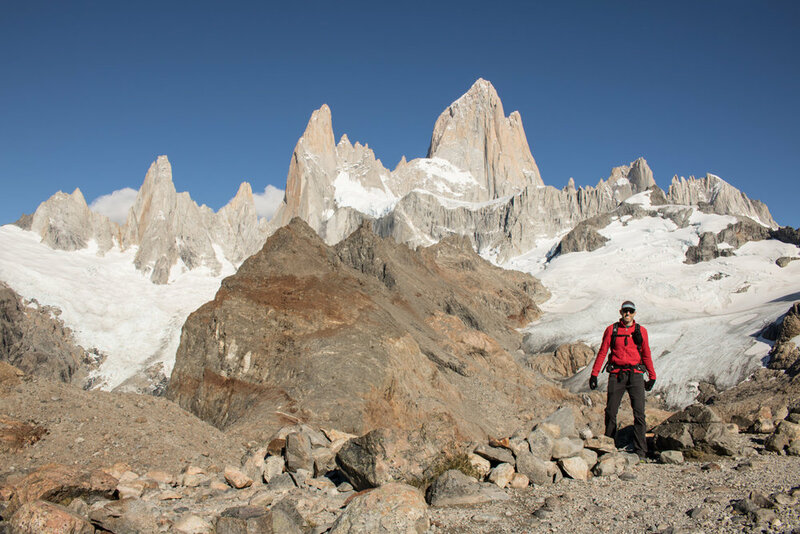 FITZ ROY - Hiking in the Fitz Roy region should be on everybody’s itinerary when visiting Patagonia. El Chalten is the laidback, charming town you'll use as a base, with trails leaving right from town. 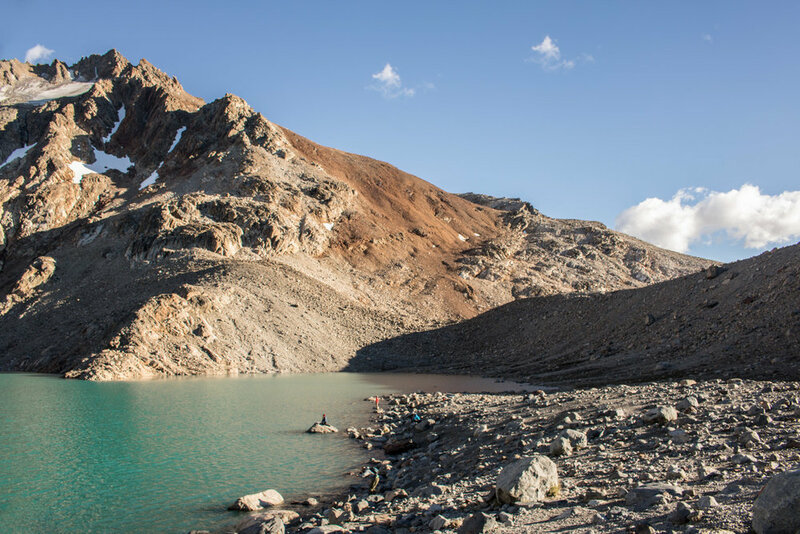 The two most popular day hikes are Laguna de Los Tres and Cerro Torre, however there are four free campsites in the park which you can use to string together a backpacking trip. HUEMUL CIRCUIT - One of Patagonia’s most challenging routes, the 4-day, 70 km (40 mile) loop around Cerro Huemul will give you some of the best views of the Southern Patagonian Ice Field. However, this hike is not for beginners. The trail is unmarked in many places, requiring GPS or map/compass navigation. Furthermore, in order to complete the loop, you’ll have to do a Tyrolean Traverse (basically a self-propelled zip line) and bring or rent your own equipment (harness, carabiner, etc). Depending on the time of year and water flow, you may be able to ford the rivers rather than zipline, but you'll still be required to have the equipment. In order to complete this loop, you’ll have to register with the park rangers in El Chaten, where they'll make sure you have the gear you need. You'll also be required to watch a mandatory safety video before setting off. For more information on the Huemul Circuit, check out The Hiking Guide to the Huemul Circuit. CERRO CASTILLO - Located in the Aysen region of Patagonia, the Cerro Castillo Reserve offers fantastic backpacking opportunities. You'll encounter the same immense beauty of glaciers, stunning mountains, and turquoise lakes, but with a fraction of the crowds down south. The 45 km route can be completed in 3-5 days and campsites are free. Logistics can be more complicated, but the payoff will be well worth it. NAHUEL HUAPI TRAVERSE - Located right outside the town of Bariloche in the Argentina Lakes District, the 40 km (25 mile) traverse can be completed in 3 days. You have the option of sleeping in refugios or camping in free campsites along the route. Though most of the trail is well-marked, the hiking can be tough and you’ll have to navigate some somewhat sketchy scree fields as you cross several passes. When we began planning our trip to Patagonia, we found most of the resources to be grossly outdated, with the existing guidebooks receiving poor reviews. Moon released a new guidebook (see below) in the fall of 2017, which we found helpful, but we used a combination of internet resources, maps, and guidebooks to plan our trip. Moon Patagonia - We used this book heavily in the planning phases of our trip. It offers a nice overview of all the regions and towns. Though there is limited detailed information on specific hiking and backpacking routes, we still found it to be a helpful resource. Torres del Paine Trekking Map- This waterproof and tear-resistant topographical map includes contour lines, point-to-point time estimates, shelters, camping and clear information on water sources. We used this map everyday on our O Trek. El Chalten Trekking Map - Updated in 2018, this topographical map covers all the trails in the hiking area of El Chaltén: the Fitz Roy mountain, Cerro Torre, Huemul Trail, Piedra Del Fraile, Poincenot, De Agostini, trail to Paso Marconi over the Patagonian Southern Ice Field, and others. It also covers Lago del Desierto and significant part of Lago O'Higgins and the glaciers that flow into it on the Chilean side. Trekking difficulty will depend on a multitude of factors including your experience, physical fitness, pack weight, and weather conditions. There are many different hikes to choose from in Patagonia with varying degrees of difficulty. If you're hiking in Torres del Paine or around Fitz Roy, the trails are well-maintained and easy to follow. Most of the popular hikes in Patagonia are not technical (no ropes, ice axes, or crampons needed). That said, there will be some long days with big ups and downs, but with most trails are at low elevation, so you won’t have to contend with the altitude issues. 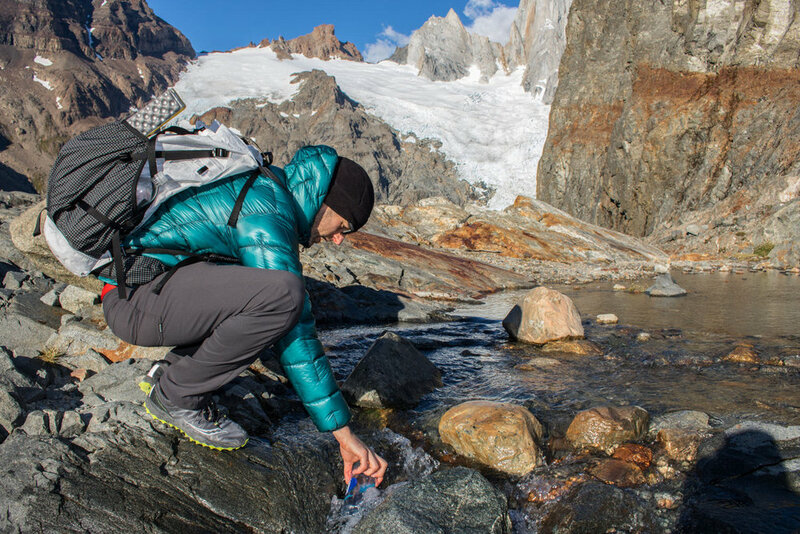 One of the pleasures of hiking in Patagonia is that you can drink water directly from the source on the trail. The National Park Service in Patagonia does a really great job at educating visitors on how to prevent contamination of water sources and keep the water safe for everyone. We still recommend you judge your water source before dipping your bottle. If there is live stock in the area or if the source runs through a trekking trail, you may be better off waiting for the next source. We brought along some chlorine dioxide tablets, but never had to use them. This is an important question for many hikers and the choice will likely come down to experience and personal preference. If you’re an experienced backpacker traveling along a popular route (W or O trek or Fitz Roy hikes), it is absolutely possible to hike independently. The trails are well-marked and maintained. If you plan to hike independently, make sure you have a good map, necessary campsites booked (mandatory in Torres del Paine), and a guidebook before you hit the trail. Also, expect to put in a good amount of planning time to fully prepare for your hike. If you are camping, you will also need to bring all your camping gear with you. There is also an option of renting gear in nearby towns, or if hiking in Torres del Paine, you can also prearrange to rent gear at each campsite. That said, guides can bring more to the table than just logistics management. Making reservations for camping in Torres del Paine can be confusing and logistically frustrating as you have to organize through three separate reservation systems. When you book with an agency, they take care of all the details (lodging, food, transportation, permits, etc). Furthermore, a good guide can also teach you about the local culture, flora, and fauna. However, be expected to pay a high price for these services. Though quality of service and lodging options can vary greatly within each travel agency, below are some average costs of guided treks within Torres del Paine with full board (all meals) included. Some agencies include all your transportation and lodging from Punta Arenas. Local information on culture, food, etc. 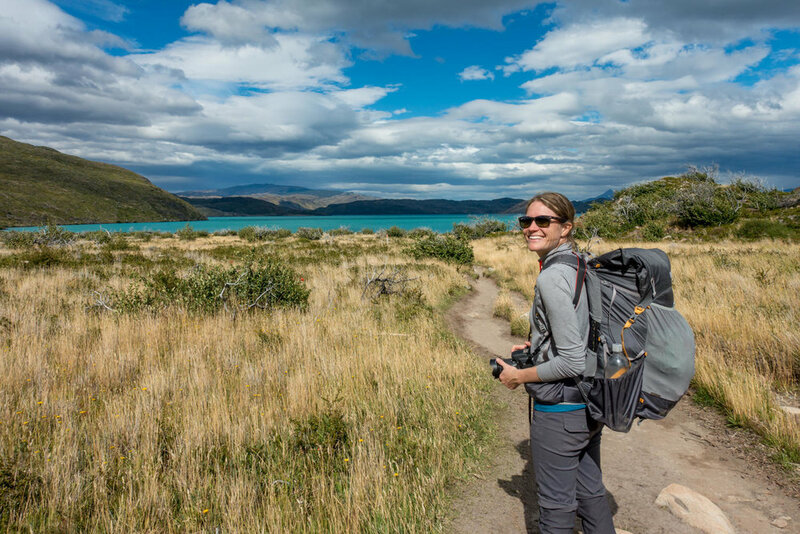 Whether you're heading out to do the W Trek in Torres del Paine or chasing sunrises on Fitz Roy, you’ll want to make sure you have the essential gear you need to be safe and comfortable. Below is a quite snapshot of some of the big gear items we brought. For a more full gear list, check out our Patagonia Gear Checklist. For more information on general lightweight backpacking gear, check out our CleverHiker Gear Guide. Patagonia is a truly special and uniquely wild place and for this reason thousands of visitors flock to this region every year. Undeniably, the cumulative effect of human interaction is taking a toll on this fragile environment. To minimize the effect of visitors and ensure the natural beauty of Patagonia remains for years to come, we ask that you please abide by strict Leave No Trace Principles while visiting. Patagonia, and more specifically, Torres del Paine is one of the last truly wild and remote spaces. At CleverHiker we encourage people to get out and experience nature at it’s finest and that mission comes with a great responsibility. If you were lucky enough to experience the breathtaking beauty of Torres del Paine, we encourage you to give what you can to continued conservation efforts. We all need to be stewards of the natural world to protect our wilderness for generations to come. We've donated to the Torres del Paine Legacy Fund which works to preserve and restore ecosystems, improve tourist infrastructure by mitigating visitor impacts, promotes community development, and diversifies recreational activities. The best part? 100% of your donation will directly support sustainability actions in Torres del Paine. Hopefully you found this guide helpful for planning your trip to Patagonia. For more helpful resources check out the links below.